With Veritas Christian Study Abroad, all programs are designed to include mission experience and education, both in and out of the classroom. Veritas Christian Abroad was the best decision of my life. I left for Costa Rica for three months and halfway into the second month I decided to stay for a second semester. God really changes you through the abroad experience, more than just school and mission work He uses every single little part of it to capture you and reveal Himself to you. I had an amazing adventure for 8.5 months in Costa Rica with 6 of them being for Veritas Abroad and I can honestly say I would do it all over again. Highly recommend abroad life to anyone!! The fact that mission work and study abroad exist together is the best thing I could have done with my summer and I truly believe this program should continue. Claire B., Georgia Southern Univ. My experience in ministry abroad was not only gratifying and useful, but it taught me lessons I will carry with me for the rest of my life. To say I was impacted by my one-month trip to Rome, Italy, would be a complete and utter understatement; my life, my perspective, my way of thinking, and my heart have been permanently changed forever. As a result of the ministry and academic opportunities a part of Veritas, my dedicated mentor, and immersion in the culture, I can truly say I have been changed in a way that is seen through both my current lifestyle and future goals. My spiritual life was strengthened, and I feel like I grew more spiritually in three months in my time in Spain than I have in my past three years of college! The Lord will use you for his purposes in your time abroad. And I learned to invest in the church, the Bride of Christ, because even after I return home, the church remains. I have learned to actively participate in kingdom-building while abroad, rather than standing idly by. That has been the most transformational aspect of cross-cultural Christianity. Don't come in with too many expectations; God will contrast them. That was one of the most beautiful realizations of the whole experience...Expectations tend to box in what you think you will learn, or do, or see, but being open minded to whatever comes your way allows space for the most surprising memories and lessons to slip in. I had no idea what I was getting myself into when I decided to study with Veritas in Chile, but I got more out of my experience than I could've imagined. Robert D., Ohio State Univ. The missions mentor and the experience at a local church were easily the most valuable. I find it so important to be around people from the culture you're studying... I loved having a mentor to guide and encourage me. She reminded me to make the most of my time here and trust God. "I cannot express in words how grateful I am to have gone to Chile and experience a semester with Veritas. God showed up in my life in a real way and stretched me to my limits. I grew so much and hope to continue to grow from what I learned while in Chile. Lorna, the mentor, is amazing and definitely anointed to do her job, her ministry. The mission work is a blessing and changes you more than you change it." Studying abroad has been the most incredible experience for me. I have grown so much as a person, as a follower of Christ, and as a global citizen. Working with Veritas made this trip even better! All of the staff genuinely took care of us and continually checked in on us to make sure that our time abroad was successful. I have become much more open minded to different world cultures and people as a result of studying abroad. I would recommend it anyone and everyone! My prayer entering into my study abroad experience was that God would redefine my definition of "home" not as a place or feeling of comfort, but as wherever He calls me to be. Not only has that prayer become a reality, but I have grown in so many ways that were unforeseen to me. Witnessing the way the church is shockingly different here than at home has expanded my understanding of the body of Christ and caused me to see myself and the church in America in a new light. Veritas is an amazing program and I wouldn't take back my experience for the world. It challenges you in ways that you might not think of and it is so exciting to learn more about yourself as well as the world around you. It broadens your worldview and you really grow as an individual. As Christians, we are all called to be world changers and in order to change the world, we must learn about the world. This is a wonderful opportunity to do that. I loved my experience so much! 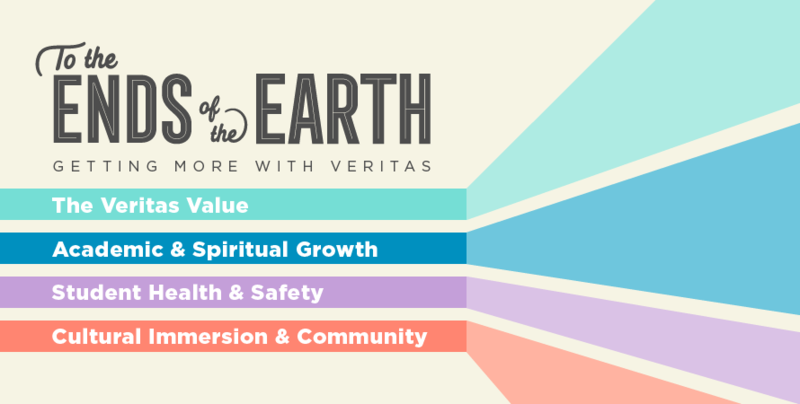 Veritas has helped me gain insight into myself, who God is, what it means to give God control, and what it looks like to lose that control. I can´t begin to describe how much this trip has touched me and changed the course of my future. I never want to stop this process of growth that started with Veritas. God is doing big things in people´s lives through this program!